Trade in services is important for many low-income countries, especially small economies which often derive a significant share of their foreign exchange revenues from services exports. Services trade and foreign direct investment (FDI) can foster productivity growth by inducing greater competition in domestic markets and providing firms with access to higher-quality, more varied, and cheaper services inputs. The performance of service sectors matters for economic growth and development by virtue of their role as inputs into production in all sectors of economic activity (Arnold et al. 2016, Beverelli et al. 2017, Hoekman and Shepherd 2017). Services also matter for households. The realisation of many of the Sustainable Development Goals (SDGs) depends on improving the quality of – and access to – a range of services. Fiorini and Hoekman (2017) find that barriers to trade and investment in services in developing countries are associated negatively with indicators of access and performance of finance, information and communication technologies (ICT) and transport services that are important for attaining the SDGs. An implication of research in this area is that development policy should seek to reduce services trade costs as well as trade costs for goods (Miroudot and Shepherd 2016). The Aid for Trade (AfT) initiative launched at the 2005 WTO Ministerial Conference in Hong Kong is a key tool through which high-income countries provide support to developing nations to do so. The initiative reflected a recognition that agreements to liberalise trade would benefit developing countries more fully if complemented with development assistance targeted at improving the ability of firms in developing economies to use trade opportunities. Total AfT disbursements are significant. They increased from an average of $21 billion in 2006-2008 to $39.8 billion in 2015 (OECD and WTO 2017). Most of this aid is allocated to African and Asian nations, with each region accounting for around 40% of total AfT disbursements. The research literature assessing the trade effects of AfT has focused on merchandise trade and investment in developing countries (e.g. Cali and te Velde 2011, Nowak-Lehmann et al. 2013, Hühne et al. 2014, Lee and Ries 2016). There has been little work on the effects of AfT on trade in services, or on the effects of the sectoral allocation of AfT on different types of trade (goods versus services). In a recent paper, we use data on official development assistance from OECD (2017) to analyse the relationships between AfT and trade in services (Hoekman and Shingal 2017). We also investigate whether aid that is directed towards services sectors is associated with greater trade in goods. A large share of total AfT is aimed at improving the performance of domestic services, both private and public, especially the availability and quality of transport and ICT infrastructure and the operation of ports and border crossings (trade facilitation projects). Based on the finding in the empirical research literature that the quality and cost of services inputs matter for economic performance, we would expect aid targeting key services inputs to positively impact the trade of recipient nations. In contrast, a much smaller share of AfT is directed towards enhancing the productive capacities of firms in services sectors. However, here also one expects a positive relationship with trade performance over time if the aid is effective in bolstering capacity. We identify six categories of AfT in the data compiled by the OECD that involve (target) services: assistance to economic infrastructure in three sectors (transport/storage, ICT, and energy); and assistance for productive capacity building in financial services, business services, and tourism activities. While the data are proxies at best for aid that is allocated to services (not all of the aid going to these sectors is trade-related or motivated), the categorisation used is the closest approximation of AfT that goes to services that the data permit us to make. Globally, AfT mapped to these six services categories increased from $5.3 billion in 2002 (59% of total AfT) to $23.3 billion in 2015 (72.%). 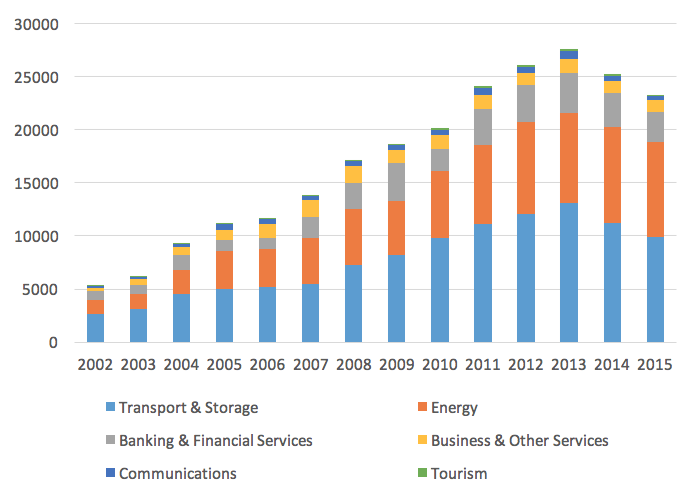 Thus, most AfT over the period was allocated to services sectors, with transport and energy sectors accounting for 45.9% and 30.2%, respectively, of total AfT in services disbursed over 2012-2015 on average (Figure 1). (In national accounts statistics, energy is a good not a service, but we include energy because most of the literature does so). Source: OECD, Query Wizard for International Development Statistics (QWIDS); own calculations. Overall, the empirical analysis indicates that most AfT is not associated with greater trade in services. There is some evidence that AfT allocated to economic infrastructure is associated with greater trade in services, with aid targeting transport increasing imports of services of recipient nations, while aid for energy is associated with more services exports. More disaggregated analysis reveals substantial heterogeneity in the relationships between AfT and trade in services at the sector level, though the evidence is statistically weak. The results also provide some evidence for the expected complementarities between AfT going to services sectors and merchandise trade. This is consistent with the role that services play as inputs into production. However, the extent to which such complementarities appear in the results is rather limited. There is less evidence for complementary relationships than would be expected a priori based on the literature analysing the relationships between manufacturing sector competitiveness and the performance of domestic services sectors (e.g. Beverelli et al. 2017, Hoekman and Shepherd 2017). Aid for productive capacity that targets non-services sectors is found to have a statistically significant positive association with merchandise trade. The bilateral AfT data also suggest a significant relationship between AfT involving efforts to bolster productive capacity and trade, specifically imports from the aid recipients. However, such a relationship is not observed between trade in services and productive capacity building assistance that targets services sectors. Given the major role services play in economic growth and sustainable development and the potential that exists to leverage new digital technologies to expand services trade, it is important that AfT efforts are informed by analysis to identify what types of assistance can support trade in services. The findings of the cross-country empirical study summarised in this column are unavoidably general in nature as a result of the limited availability of disaggregated services trade statistics for many developing countries. But the fact that we find hints that there are statistically significant associations between some types of AfT for services and trade in specific categories of services suggests there is value in devoting greater attention to the design of AfT to make this a more effective mechanism to support services trade. Such efforts require country-level analysis so as to be able to consider both cross-border trade and foreign direct investment in services as well as the complementarities between different types of AfT and trade in goods and services. One question for more in-depth country analysis is to assess the robustness of our finding that AfT for productive capacity building appears to ‘work better’ for trade in goods than for trade in services. The revealed preference to date has been for AfT primarily to be allocated for services infrastructure and for productive capacity building projects to target merchandise exports. Our findings suggest that from the perspective of supporting trade in services, more in-depth analysis is needed to understand what can be learnt and emulated from productive capacity building AfT that targets merchandise trade. Arnold, J, B Javorcik, M Lipscomb and A Mattoo (2016), “Services Reform and Manufacturing Performance. Evidence from India”, Economic Journal 126(590): 1-39. Beverelli, C, M Fiorini and B Hoekman (2017), “Services Trade Restrictiveness and Manufacturing Productivity: The Role of Institutions,” Journal of International Economics 104: 166-82. Cali, M and D W te Velde (2011), “Does Aid for Trade Really Improve Trade Performance?,” World Development 39(5): 725–40. Fiorini, M and B Hoekman (2017), “Services and Sustainable Development,” CEPR Discussion Paper 12203 and EUI RSCAS Working Paper 2017/41. Hoekman, B and B Shepherd (2017), “Services Productivity, Trade Policy and Manufacturing Exports,” The World Economy 40(3): 499–516. Hoekman, B and A Shingal (2017), “Aid for trade and international transactions in goods and services,” CEPR Discussion Paper 12250 and EUI Working Paper RSCAS 2017/44. Hühne, P, B Meyer and P Nunnenkamp (2014), “Who benefits from aid for trade? Comparing the effects on recipient versus donor exports,” Journal of Development Studies 50(9): 1275-1288. Lee, H and J Ries (2016), “Aid for Trade and Greenfield Investment,” World Development 84: 206-218. Nowak-Lehmann, F, I Martínez-Zarzoso, D Herzer, S Klasen and A Cardozo (2013), “Does foreign aid promote recipient exports to donor countries?” Review of World Economics 149(3): 505-535. OECD (2017), “Aid for trade statistical queries”. OECD and WTO (2017), Aid for Trade at a Glance 2017: Promoting Trade, Inclusiveness and Connectivity for Sustainable Development, Geneva: WTO and Paris: OECD Publishing.